Relyence Maintainability Prediction has the MIL-HDBK-472 Task library built-in and also includes the ability to create your own libraries. For maximum efficiency, Relyence Maintainability Prediction includes the ability to create your own data libraries of the building blocks used in maintainability prediction analyses: Tasks, Tasks Groups, FD&I Outputs, and Maintenance Groups. Relyence Maintainability Prediction has the tasks defined in MIL-HDBK-472 built-in for easy look up and retrieval. Relyence Maintainability Prediction has the task data found in MIL-HDBK-472 built-in for you. This means that you can automatically search and retrieve the commonly used task information provided in the MIL-HDBK-472 standard. You can use these Tasks as building blocks when defining your Task Groups and FD&I Outputs as well. You can supplement the supplied MIL-HDBK-472 Tasks with your own Tasks. 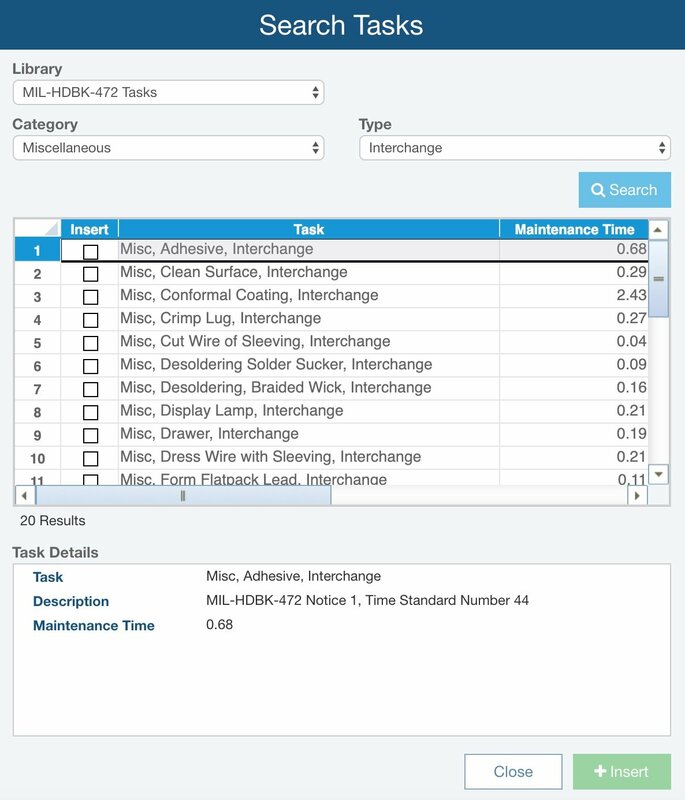 You can build up a complete library of your own known repair task information for reusability and consistency. You can define basic Tasks – simple, elemental actions – along with their parameters, such as maintenance type and time. You can then combine those Tasks into a series of steps – or a Task Group. 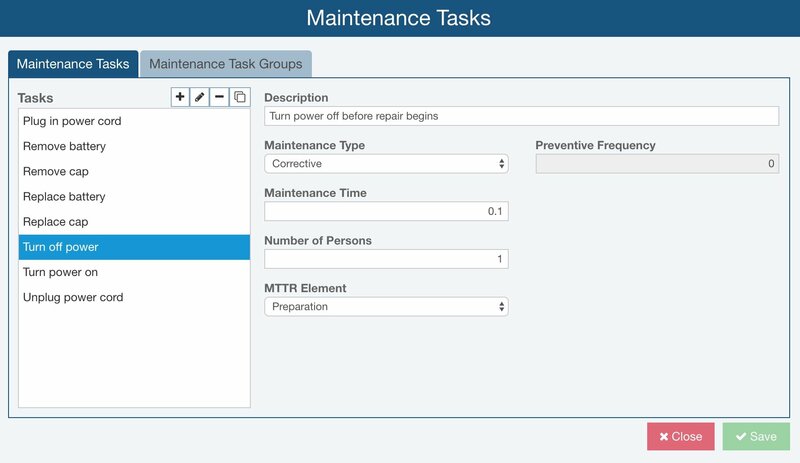 Your Relyence Maintainability Prediction library can include both Tasks and Tasks Groups. Relyence Maintainability Prediction includes a search tasks feature to enable you to easily review and retrieve tasks from your library. As your Tasks libraries grow over time, the ability to find the specific Tasks you are looking for may become more difficult. 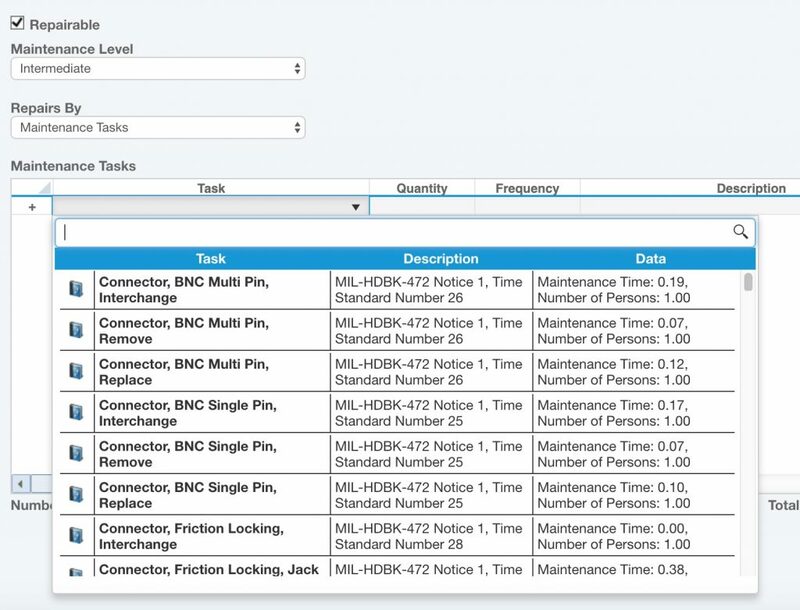 Relyence Maintainability Prediction includes a useful Search Tasks capability to help in quickly locating specific Tasks and retrieving the data automatically. From any Task Table, click the Search icon to activate the Search Tasks function. You can filter results as needed, locate matching items, and insert one or more repair Tasks quickly and easily. 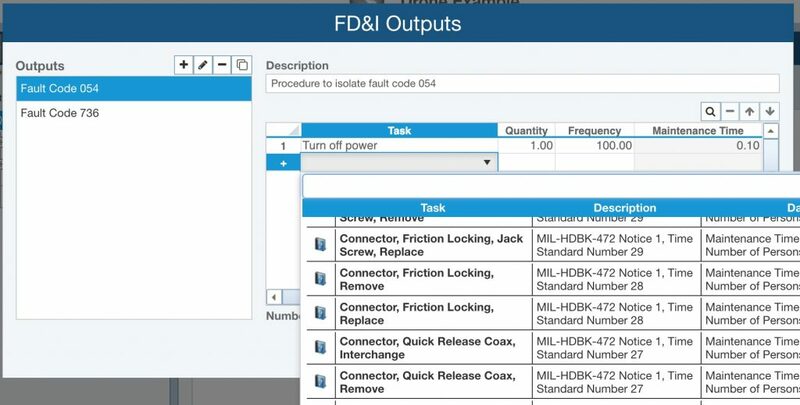 In addition to Task libraries, Relyence Maintainability Prediction supports the ability to create your own FD&I (Fault Detection & Isolation) Output and Maintenance Group libraries. By first creating all your Maintainability Prediction libraries, you will have all the necessary building blocks required to completely define your maintenance activities across your company in a consistent and organized way. You can continually update and enhance your libraries as your processes evolve to keep your analyses up-to-date and accurate.